Thanks to everyone who emailed me about the species of bird in my last post – for those still in the dark they were marabous. Now stop with the emails already! So today the Wee Bern and I shared a cab into Kampala. I waved goodbye to the staff at The Boma and vowed to come back for another night’s stay before I fly home in June. The road out of Entebbe may be tarmaced but the roadside is not paved. It’s a bright terracotta clay and it’s littered with small potholes and stones – the last reminder of what the highway used to look like before it was covered. Flanked on either side of the road there are small wooden shacks; dilapidated businesses and fruit sellers wearing bright coloured clothes from rickety stands. But the backdrop to this scene is vivid and lush green vegetation. When I first arrived in Uganda I remember being surprised at seeing so trees and bushes this deep colour; I was expecting trees and shrubs to be yellow and scorched from the sun. One of the brick houses we passed, had a sign painted on the side wall in white capital letters: THIS LAND IS NOT FOR SALE. A stark reminder of how disgruntled people have become with foreigners who promise the world and deliver a pittance. The story is the same in all developing countries, the wealthy bulldoze their way in, turf the locals out, and make vast sums of money. As we drove into the capital the first thing you notice is the smog and the dust. Both lie thick in the air. 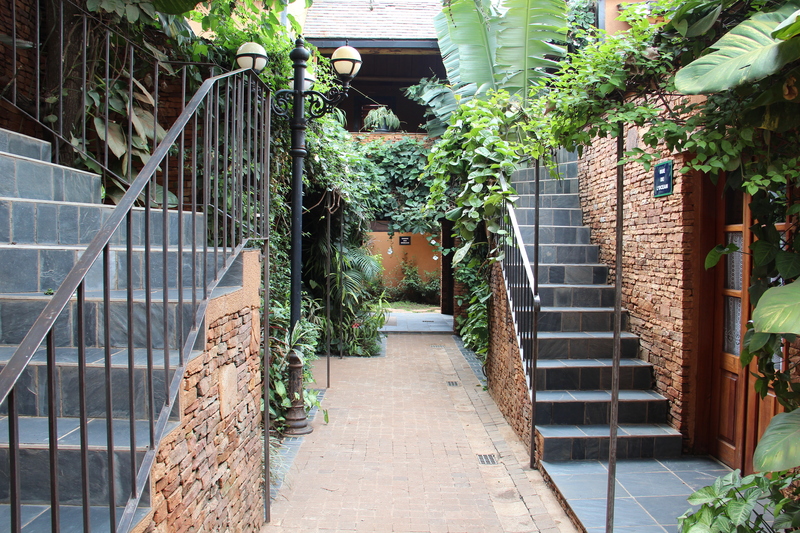 Entebbe is more like a bustling village in comparison to the craziness of Kampala. On recommendation from my best mate, the Wee Bern and I checked into Le Hotel Bougainviller – what a hidden treasure! It lies 3km outside of the city and it’s beautiful, simple and chic. Today we had a busy day of visitors popping in for mango juice on the balcony. First to arrive was Richard Kavuma. A Ugandan journalist I was introduced to in London. He used to freelance for The Guardian website and recently completed a 2-year Journalism Masters Degree in London. The smarty pants graduated with a distinction – thoroughly well deserved. It was wonderful to see Richard. He gave me an almighty squeeze and told me it was surreal to have me here. Next was Cat Hobatier. A post doctorate researcher at the Budongo Conservation Field Station. I’ve never met Cat but we’ve spoken on email and SKYPE and she’s been very supportive. She is also the reason I am back here doing my Masters’ project. Cat has lived in Uganda for the last 7/8 years and knows the forest and the chimps well. She was one of the first people to notice the disappearance of the Cordia millenii tree and says she was alarmed at seeing the wood being stockpiled at illegal pitsaws. The tree is an important food source for the chimps and is also a valuable timber source for the local human population by the lake. They use the wood to build boats and canoes to fish – so here we have human/wildlife conflict in all its glory. It was lovely to finally put a name to a face. She’s flown home to the UK this evening to carry out 8-weeks of teaching at St Andrew’s University. I am hoping our paths will cross on my journey out of Budongo and her return. Then came Dr Lawrence Mugisha. 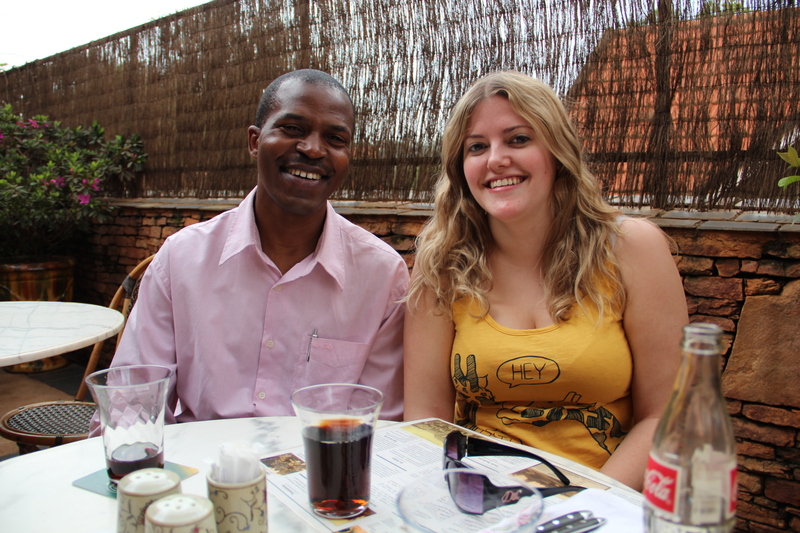 The man who made it possible for me to come to Africa in the first place. 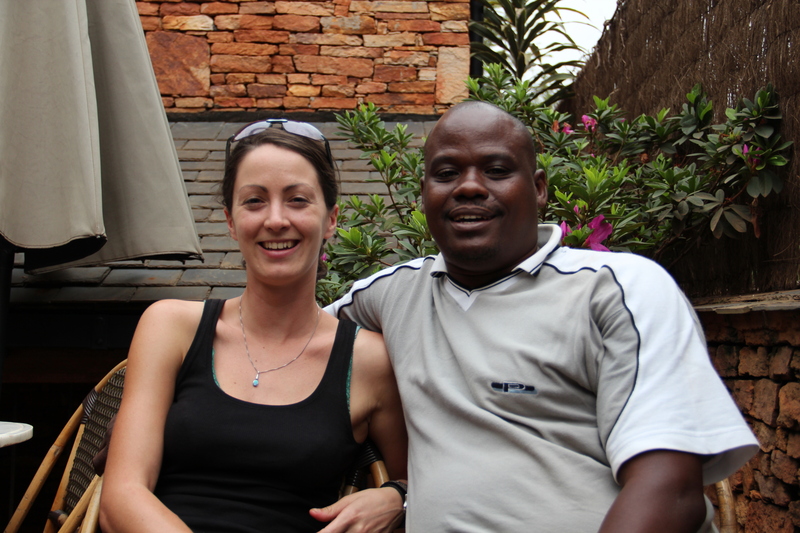 In 2010 he gave me access onto Ngamba Island in return for filming what they do there. A charismatic man with so many letters after his name it looks like half the alphabet. He is an expert in wildlife health and biodiversity conservation, eco-health and livestock research, disease management and surveillance. Last March he founded the charitable organisation, Conservation and Ecosystem Health Alliance (CEHA), in the USA. A year on and he has now established it here in Uganda, in fact the ink only dried last week. It aims to use a multi-disciplinary approach to create sustainable conservation throughout Africa, starting in Uganda. The main objectives are to address health (which includes disease transmission) and environmental issues that surround human/wildlife issues. The CEHA wants to promote the well-being of both the human population as well as the animals – with particular focus on the great apes. The two live side-by-side so it’s crucial if Non Governmental Organisations (NGO’s) are to make progress. He told me that for the next five years, the organisation will only focus on the Albertine Rift area. Having said that, it’s an enormous area so he does have his work cut out for himself. It’s also part of the landscape I’ll be collecting research in, so he’s a very good egg to know. Why has the interactions increased? Dr Mugisha says it’s because the forests are disappearing fast. In 2007 he says there were still some areas that were intact; now he says the majority of forests are fragmented which means humans and animals are crossing into each other’s habitats with alarming frequency. He added: “Local people end up chopping down forests in order to plant rice; tobacco; sugar cane and other agriculture. They do it because they believe their livelihoods will improve if they plant these things. “They earn good money which helps to pay for food; school fees and a basic way of life. Lots of people don’t know a way forward and there is pressure from big international companies. CEHA wants to work with the people to educate them about how to achieve a livelihood in a more responsible and sustainable way. “We’re running projects that will offer people financial incentives such as keeping chickens or pigs instead. If we don’t act now it is only going to get worse. The big logging companies are cutting down indigenous trees and replacing them with Australian Pine and Eucalyptus because it’s a more lucrative timber. I have seen piles of indigenous trees just left on the roadside. Changing the habitat like this means long-term we have no idea what will happen to the biodiversity. Like most conservationists Lawrence is full of beans, his enthusiasm is infectious and I sincerely hope this project thrives. He believes that by empowering local people with skills and giving them knowledge; they can continue living where they do and earn a living without destroying habitats permanently. The problem isn’t the local people, the problem is the big multinational companies waving a carrot in front of their faces. Notes: Dr Lawrence Mugisha is the executive director of CEHA which receives funding on a yearly basis from Minnesota University. He lectures in Animal Resources and Biosecurity at the Makerere University in Kampala Uganda. As well as at the College of Veterinary Medicine at the University of Minnesota, USA; and the Nelson Mandela Institute of Science and Technology in Arusha, Tanzania. Anyway http://www.mindocloudforest.org/ has some good ideas — getting carbon credit for having the local farmers doing forest-friendly coffee (sold back in Minnesota). I saw a lot of this when I studied conservation biology and sustainable development in Costa Rica in 1992 — so now the farmers are paid to protect the local forest and trained to be wardens, etc. Fascinating and very impressive people you are working with. Thanks again for sharing. Many thanks for the info. I’ll have a look at mindocloudforest.org later this week, sounds good though. Yes Dr Clay emailed my last week, but I had quite a lot on so didn’t have time to meet the embargo. I’m sure I’ll get to it soon enough though. My connection in Budongo may not be fantastic and I am buying a modem today before I leave kampala so that I can continue to write. Gpod to have your comments. vegetation have adverse reactions on the wildlife? I was reading an article on self medicating. aframomum melegueta, which along many things is an antiinflammatory. nutrients they seem to want? Its disgusting what big business gets away with. Greed is the most destructive thing in the world. How they destroy this natural heaven. Con the locals. Whatever happened to the conscience? opened early so that they one day can make the right decisions.